I know the cookies are delicious, but that’s not the point. I know you feel hungry now, but look at the non-cookie parts of the design! A cookie sports a sash with three badges from various levels of scouting. 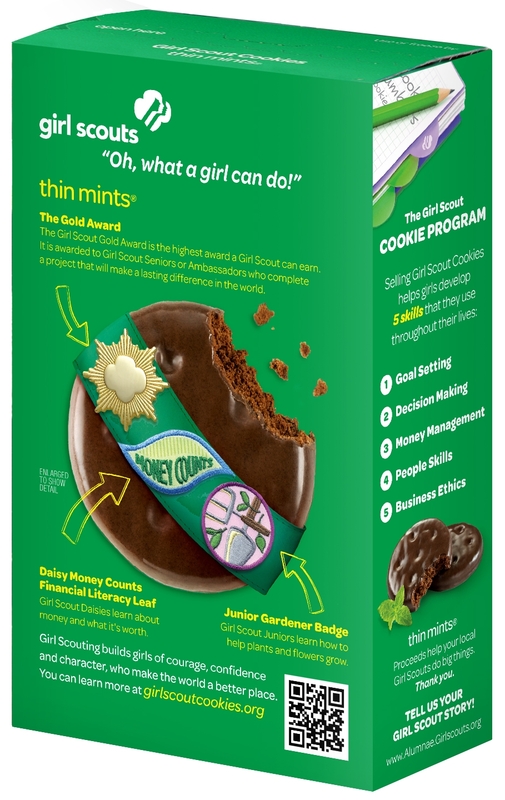 The pattern for the badges seems to be: the Gold Award, Girl Scouting’s highest award and answer to the Eagle Scout, a financial literacy badge (presumably to highlight what the girls will learn via cookie sales), and a more creative badge. I think this is genius! If people’s only interaction with scouting is a cookie box, use the box to advertise the real things scouting means to the girls involved. As a Gold Award recipient myself, I’m especially eager to have that award achieve the wider recognition it deserves. Although the cookies are delicious, they’re far from the point here. At least the ultra-religious conservative reactions acknowledge the substance of scouting (though they get it hilariously twisted): Girl Scouts are a progressive, empowering, feminist organization.